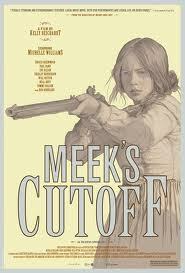 A while back, through joblo.com, I heard some praise about an upcoming independent film called Meek’s Cutoff. I was disappointed to learn that it wasn’t about trends in blue jean fashion, but I was intrigued none the less. It’s about a group of settlers back in ye olde covered wagon days, and critics are gushing about it. Michelle Williams is starring, and I didn’t realize until a second viewing of the trailer that Bruce Greenwood is playing the titular Meek. 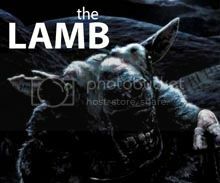 I’ve always thought he was a solid actor, and it’s nice to see him headlining a movie that’s got critics buzzing. Fans of The Oregon Trail take notice, because this is probably as close as you’re going to get to a live action version of the beloved computer game. 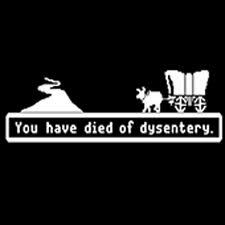 I’m sad I won’t get to see a big celebrity try unsuccessfully to ford a river, die of dysentery or experience the other tragedies that the game used to throw at me. Cutoff will be playing soon at Jacksonville’s 5 Points Theatre, so I’ll definitely be checking it out. Despite all the positivity and Mr. Greenwood, I’m honestly not sure how much I’ll like the film. It looks sort of slow and contemplative, and it’s no doubt a little depressing. And Paul Dano really annoys me. I did download The Oregon Trail for the iPhone, though, and nothing bad’s happened to me yet! p.s. While cruising Wikipedia to find out just what a cutoff is exactly, I discovered that Meek’s Cutoff is based on a true story – or a true cutoff anyway. I’m not sure if the film will follow whatever happened in real life, so read the Wikipedia entry at your own risk.